Its one of the great Hollywood lines. Apollo Creed the heavyweight champion has just been taken the distance by the unknown southpaw Rocky Balboa. This was of course an exchange of lines from a fictitious movie, where the heavy underdog finally finds a purpose and emerges a hero. With the NFC and AFC Championship games starting in less than 24 hours there are two Hollywood scripts that are waiting to grace the silver screen. For two future Hall of Fame enshrinees it is an opportunity to match Rocky, and take a further step to becoming a World Champion. Both the Atlanta Falcons tight-end Tony Gonzales and the Baltimore Ravens middle linebacker Ray Lewis have huge emotional investment from their fans as Sunday ‘could’ be their last ever NFL game. Anyone who is not a fan of the final four teams should be having their heart-strings pulled by these two living legends, as they battle through to the Super Bowl complete with teary post-game press conferences and premature confetti. Problem is some dreams are not meant to come true, and Sunday will be where the analogy of this particular Hollywood boxing film will fade away like a reel of archived 1970’s celluloid. 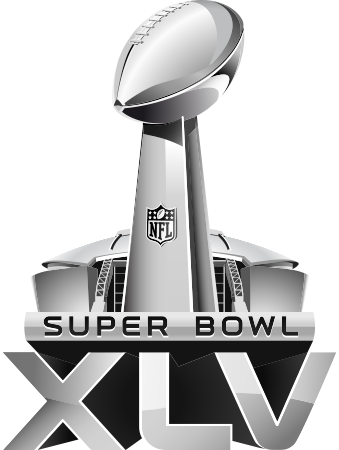 I just can’t see the Baltimore Ravens stopping the New England Patriots (who will be at home) from returning to the Super Bowl, where I predict they will battle the San Francisco 49ers, fresh after defrosting from a cryogenic freezing process administered in the mid 1990’s. Saying that I must have Sylvester Stallone on the brain as the whole defrosting comparison led me to think of Demolition Man. I am admittedly making a big hash out of my playoff predictions this season, with my only two highlights being predicting the exact correct score for the Texans v Bengals Wild-card game and the fact that the Falcons would actually advance from the Divisional Round of the playoffs. 49ers backs Frank Gore and Lamichael James will grind out the tough yards behind battering ram fullback Bruce Miller. The Falcons will be intent on holding Kapernick to under 75 yards rushing so Gore will want to get 20 carries. If Gore gets over 25 I can see the Niners winning by at least a touchdown. 49ers outside linebackers containing Tony Gonzales. Dialing up too many blitzes will give Tony time to get warmed up so the 49ers will need Ahmad Brooks to remain patient. 49ers to win 31-27 in a game that looks close if you just see the final score but in truth is dominated by the 49ers for the majority of the game. I don’t think Colin Kaepernick will be as dominant as he was against a porous Packers defense, but I do see him passing for three touchdowns. Pats tight-end Aaron Hernandez need to have a big game. As the Boston Mayor informed the media ‘Gonk’ is out, so Hernandez will be asked to form part of the big woven safety blanket that consists of Wes Welker and any Patriots running back named Ridley, Vereen or Woodhead. The Ravens will be determined to get in the grill of Tom Brady to stop him getting into that mesmeric rhythm that has taken him to five previous Super Bowls. The Ravens gave up two special teams touchdowns last week, something that the previous Super Bowl winning Ravens team would not have allowed. I have predicted the Ravens to lose the last two weeks so I feel obliged to do the same again. This time I don’t see the result being as close as last year. I do see the Patriots offense stalling in the red-zone, but my bold prediction is Pats kicker Gotkowski connecting on five field goals. Patriots to win 29-19 in a game where Tom Brady is rattled but not derailed. 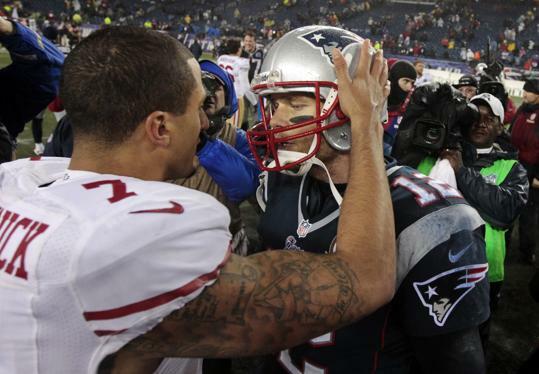 This gives me a 49ers v Patriots Super Bowl. To end on a pugilistic note a knockout game you must agree. Early this morning I put on the internet radio to listen to ESPN 980 to get the latest playoff gossip. Didn’t expect to shed a tear whilst feeding my daughter breakfast, but after listening to the story of former Baltimore Ravens linebacker and special-teams ace O.J Brigance I had to go and get a tissue. Brigance has amyotrophic lateral sclerosis otherwise known as motor neuron disease. This means Brigance cannot use his arms or legs, and cannot speak. He communicates via an electronic voice box. None of this has meant Brigance has spent time away from football, as he is the director of player development at the Ravens. It was Brigance who set the tone at Super Bowl XXXV (the only one the Ravens have won) as he recorded the opening tackle of the game as a special teams ace on the Giants kickoff return. Now Brigance is again setting the tone as the Ravens, led linebacker Ray Lewis, the MVP of that said Super Bowl, are two games away from playing for a second Vince Lombardi Trophy. Brigance sends team mates email messages and also speaks to the players and coaches during the week and in the locker room. The vast majority of focus will be on Ray Lewis v Peyton Manning today, but spare a thought for a man who cannot stand, cannot talk, cannot tackle, but CAN inspire a team and a city to a huge playoff upset against the red-hot Denver Broncos. I do love a good Disney film, where you root for the hero to conquer all evil. OJ Brigance is no cartoon hero, he is a real person, and whilst his vocal cords no longer generate any sound, it is his heart and soul that will scream above all the noise of two sets of fans and the stadium sound system inside Mile High Stadium later today. Can the Ravens win today – yes they can. Adversity is simply a word. To find out more about OJ Brigance’s Foundation the Brigance Brigade click here. 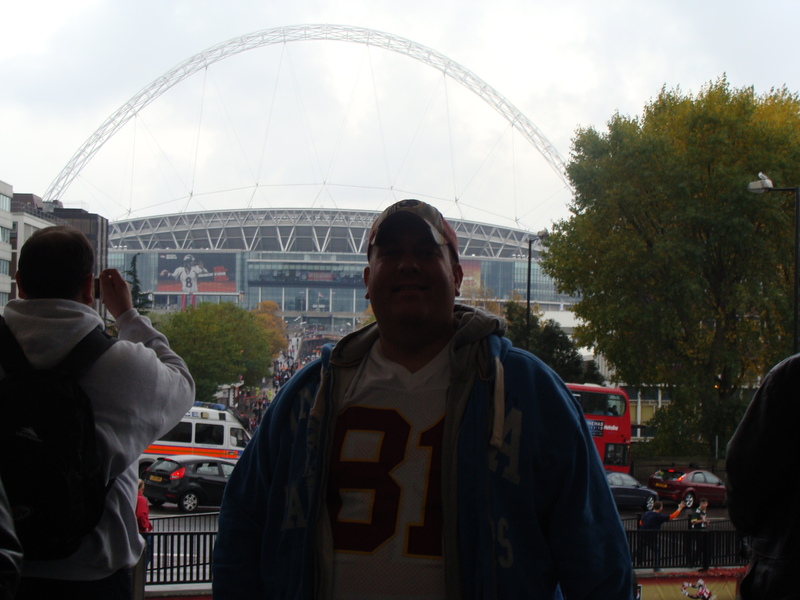 I haven’t missed an NFL game at Wembley Stadium since 1987 (Los Angeles Rams v Denver Broncos) until tomorrow. Whilst it has been painful to think that a real NFL regular season game is taking place about two hours drive from my doorstep tomorrow I do have a legitimate reason for not attending the Tampa Bay Buccaneers hosting the Chicago Bears in England – the birth of our first child Gabriella Ruby Vos. 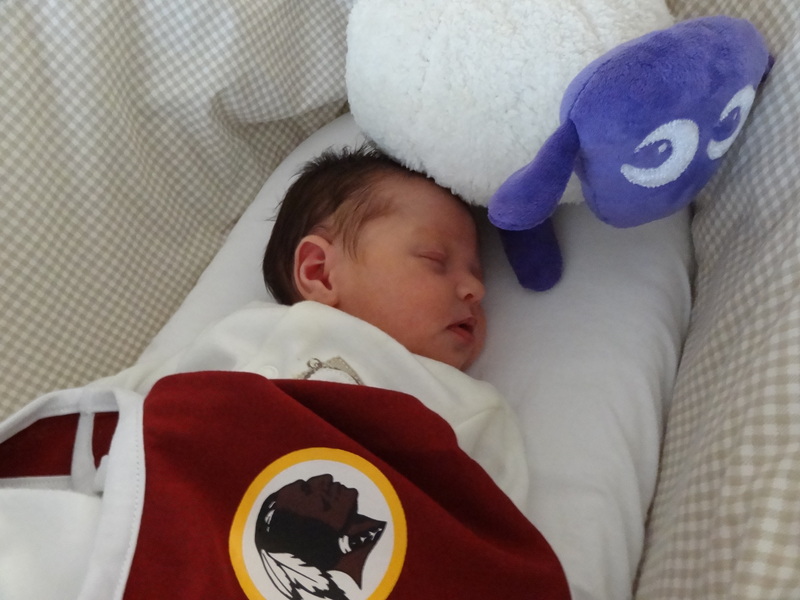 Gabriella is just over two weeks old, but in terms of due date she arrived almost two weeks early so there was never a chance I was even going to have bought a ticked to the 2011 NFL International game. For the first time since 2007 I will be watching the two NFL teams that have made it over to this side of the pond from the warmth of our living room, wearing shorts and a t-shirt. I love the game atmosphere and the fact I am witnessing a game that actually counts, but I never loved the weather in late October – its usually raining at Wembley and it is normally quite nippy. Watching the game at home will be a new experience – and a much cosier one. I am gutted that I wont get to see Devin Hester electrify Wembley with his dazzling kickoff and punt return skills, gutted I wont see Julius Peppers attacking Buccs offensive tackles with his super-human wingspan, and gutted I wont see the Bald warrior Brian Urlacher (makes me sound like a Bears fan!). I hope Tampa come back with winning on their mind as they were pretty awful when they last came over and got embarrassed by Tom Brady and the New England Patriots. Game MVP Earnest Graham the unsung Buccs RB who is the perfect workhorse do-it-all backup and a man who deserves more love. To all the fans from England, Great Britain, Europe and those coming from the Stars and Stripes I would like to wish you all a great day out in London, which I hope stays dry and sunny. Raise a glass of ripoff Wembley beer from me and have a great day. Ill be back in 2012 for the 6th annual NFL International Game – maybe NFL people will even bring the game forward so its a bit warmer – Roger why can’t you do September in London sir? Ill miss putting on my Art Monk shirt and seeing the Wembley arches. Not one to get excited by watching pre-season NFL football, even I have had wry grin on my face after reading and listening to reports about Patriots rookie tight end Aaron Hernandez. The former Florida Gator is already being targeted by Super Bowl winning QB Tom Brady more than a straw bale circle at an archery contest. I run two full 55 man roster fantasy leagues, and in both leagues I picked up Hernandez in the rookie drafts. Man do I feel good about that situation right now. My prediction for Hernandez’s rookie NFL stats are realistic, I’m going for 40 catches and 400 yards and 3 touchdowns. I have a gut feeling those inked arms will be making a few highlight reel catches before we even hit October. Having caught balls from Tim Tebow (in college), adapting to his unique throwing style, Hernandez will now have to reprogram his hands to catch from one of the NFL’s greatest. I know the Patriots drafted another TE higher than Hernandez in the 2010 Draft, namely Rob Gronkowski, but the style of play in New England is better suited to the multi-dimensional Mr H.
Rumour has it the Patriots will be using a 3 TE set, moving Hernandez around the field, from TE to slot WR to HB/FB. If that happens my predictions could be exceeded. With Randy Moss streaking downfield,Wes Welker back fit, and guys like Julian Eldleman looking for targets, there will be plenty of times that Hernandez will be marked by a linebacker or a slow safety. It all adds up for a spectacular rookie season. If Hernandez translates his pre-season potential into regular season results then he could be looking at more than a pat on the back come January 2011. What do YOU think of Hernandez’s prospects as a rookie?